Not what you were expecting? Don't fret, there are better pictures below. I couldn't resist. I took these pictures in a matter of seconds because I was juggling this little project, a homeschool assignment for Isabella and working with limited napping time for Finnley. I guess what I am trying to say is there was a bit of stress associated with these pictures and when I opened them in Photoshop, all I saw staring back at me, were two large eyes. I laughed out loud and went with the moment. Drew the eyes that were magically looking at me on the screen. I think it works. I have been wanting to make these again for a long time. I made them for the first time 2 years ago when I returned from a trip to NYC. We stopped into a little pub off Broadway and found ourselves ordering three of these. I thought to myself, " what a perfect combination--egg and sausage". It took me a while to get mine to look like theirs and taste just as good. My first few attempts I deep fried them. Although I like the very crispy exterior I didn't like the idea of frying them. I decided that I would give it a shot in the oven and bake my little googly eyes--I mean--scotch eggs. It worked. I was really happy with the results. 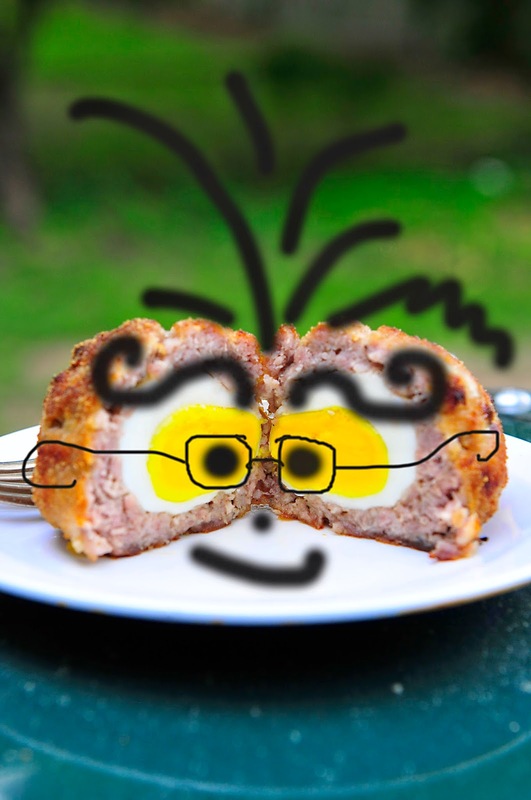 The inside egg was perfectly cooked through--no ring around the yolk-and the sausage with breading had a nice texture. I will say that when they are reheated the next day you will lose that bit of crunchy-firm outside. These make the perfect quick breakfast to take camping. I make them the day before. Wrap them in foil, toss in the cooler and when ready to use, lay them on an open grate above the fire. Turning them every few minutes until heated through. Easy? YES and I like it that way when camping. Baking and frying gluten free recipes that call for breadcrumbs used to be a problem for me until I figured out a solution that works well in my kitchen. I have purchased the little plastic containers in my local grocery store labeled: gluten free bread crumbs. I don't like them. They always seem to bake very hard and the texture feels like I am eating sand. This is what I do. I use a brand of gluten free bagel-style crackers with the flavor of garlic and onion. I add the box to my Vitamix, zap it a few times and I have perfect bread crumbs that are seasoned perfectly. I store any leftovers in an air tight baggie in the freezer. Looking at the above picture you can see little specs of the breadcrumbs catching the light from my window. I would be really interested in knowing how you make your gluten free breadcrumbs or a brand that you find acceptable. I am always open to new ideas. 1. Preheat oven to 425 degrees and spray baking dish with cooking spray. 2. In a small pot, place eggs and enough water to cover the eggs. Turn heat to medium high and cook for 8 minutes. Eggs will not be hard-boiled at this time. The yolk will still be very soft. 3. Cool eggs and peel. Be very careful when peeling because of the soft center. 4. Divide the pork into four portions. Place one portion in the palm of your hand and flatten. Place an egg in the middle and gently wrap the sausage around the eggs. Seal any open edges. The whole egg should be wrapped in sausage. 5. Place the bread crumbs in a small bowl. Roll the sausage-egg in the crumbs and place on a baking sheet. Spray the eggs with your favorite cooking spray. 6. Bake the Scotch Eggs for 20 minutes, rotate dish, and bake for an additional 20 minutes. Baking times may vary because of oven temperatures. You want your egg to be golden brown on the outside and firm to the touch. Genius way to make your own gf breadcrumbs! 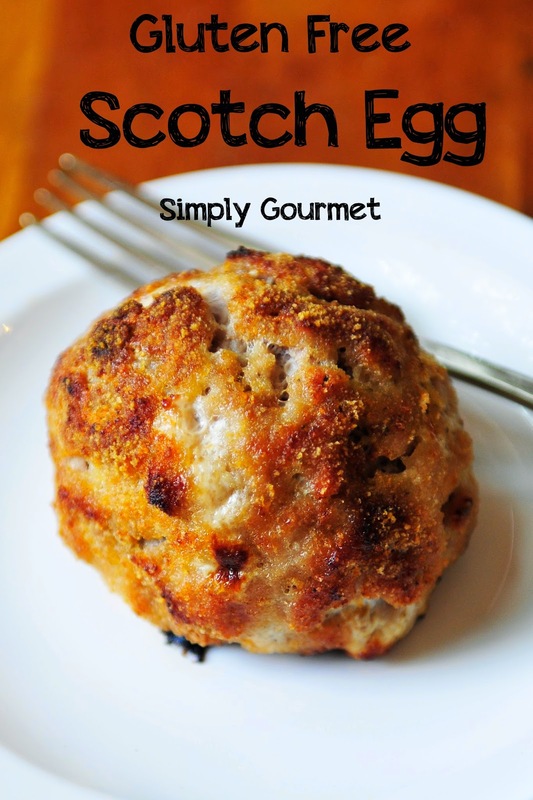 I've always wanted to try a scotch egg, and love that you baked it instead of frying! Thanks Laura. When I tried the baked version I knew that I would be making them more often. Enjoy your day and thanks for the comment. Thanks Liz. I would love the little ones too. I should see if I can find some quail eggs for more of a bite size version. Thanks for the idea. Have a great day! 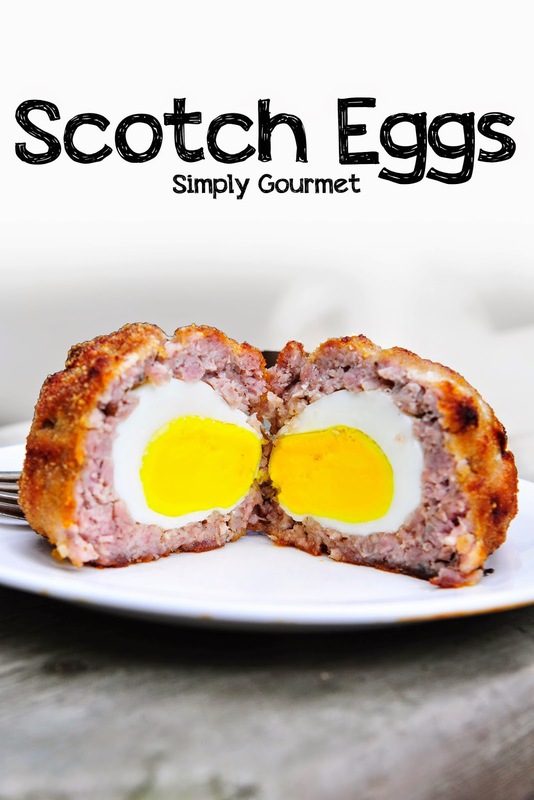 I love Scotch Eggs the first time I ever had them I was in Jr. High. My best friends mother (she was born in Scotland) made them for me. Lucky! I can't believe it took me so long to discover something so delicious...LOL Thanks for the comment Pam and have a great week. I hadn't ever heard of a scotch egg until I bought the cookbook Well Fed. They are so yummy! I've made them using ground pork rinds which makes a nice crunch on the outside.